Wells Fargo Propel Worth It? 1 rewards points for every purchases. 3 points for car rental, eating out, ordering in, gas, rideshares, transit, flights, hotels, home stays. 30,000 bonus rewards points in first 3 months. No APR for the first year. After a year later 14.49% to 26.99% interest rate. It can be a good option for travel. High security options with zero user liability. Cell phone protection which will protect you against phone thefts. 25.99% to 27.99% Cash Advance APR is a little bit high. 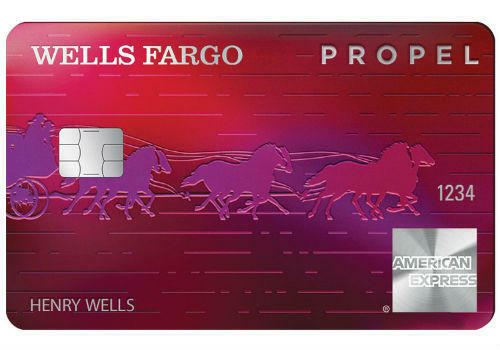 Wells Fargo Propel American Express® Card is not good for those who want to have credit card with bad credits. 5% fees for balance transfer and cash advance high. You can find a detailed review for each facts of Wells Fargo Propel American Express Card below. We are going to discuss interest rates, rewards, bonuses and fees of the card. If you would like to ask us anything regarding our review, please let us know with commenting this page. 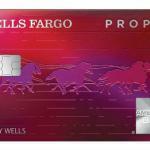 Wells Fargo Propel American Express® Credit Card is one of the most famous credit card products of the Wells Fargo. It is also an amazing travel card which provides 3x rewards points for flights, hotels, transits, etc. The gas rewards points is also 3x which makes this card very good. There is no annual fee of the card and also No APR for purchases and balance transfers for 12 months. There is a transaction fee at foreign purchases with the card. The rate of the payment is 3% and it is too much. You will need to make these payments for each purchases you make from abroad or foreign shops. There is no annual fee of the card. That will help you to save a little bit. 0% introductory APR for 12 months is very good. Then the APR is going to be 14.49% – 26.99%. If you have a good credit score and if you get 26.99%, this is going to be too much for you. If you are planning to use this card for long-term, you should think twice about the rates. Cash Advance rates are already very high. The card is providing 30000 sign-up rewards points and this is very good. The amount of sign-up bonus is making card beneficial for consumers at short-term usage. The card is also one of the best sign-up bonus cards in our list. There is not too much credit cards that can offer 30000 rewards points to consumers. There is also intro balance transfer fee for first 4 months. You are going to pay 3% for transfers with the card. However then you will need to pay 5%. The regular transfer fee is high. We believe that if Wells Fargo determines the normal fees as 3%, the card is going to be more profitable for consumers. Cash advance fee rate is 5% for the card and this is very high for this card. We generally recommend 3% rate at the least to consumers who are cash advance too often. 5% rate for each cash advance can be a problem for you with interest rates. You will need to higher credit score than 670 at the least for hope to get this card. If you have lower credit score, you will want to take a look at alternative credit cards. There are also good promotions of FNBO, Regions Bank and Capital One. You can take a look at those options. Chase is also another company which can be a good alternative. Unfortunately there is not any long-term reward cards like this in Wells Fargo. You can earn massive rewards with Visa Signature credit card of the company. You can check the that card alternatively. The card offering good rewards points for their users especially at necessary purchases. See how much bonus you can get with what kind of purchases in the pros table above. However cash advance APR and Purchase APR are very high on the card. Fees are also very expensive. Especially we were expecting card to have no fee for foreign transactions. This card can provide some advantages to you for first 12 months. However after 12 months later, things are going to be more expensive for you. You will need to ensure that you spend much for these categories: car rental, eating out, ordering in, gas, rideshares, transit, flights, hotels, home stays. Wells Fargo Propel the card doesn’t worth it. I believe that this is not a bard card at all. However with current interest rates and feels, if you are not earning enough, this card can be a serious problem for you to pay debts. We recommend you to calculate your expenditure and rewards. You can also ask our support to make calculation for you. You can leave a comment below for this. There is rates of the card and also editor scores of Credit Cards Center below. You can also read Wells Fargo Propel American Express Card reviews which has made by users below. You can leave a review for this card below or you can also tell your good or bad experiences. Please leave a fair review because user reviews are determining card rankings and scores on our website. Wells Fargo is trying to promote this as the best card but I don’t think it is… Visa Signature is better than this guys. Of course they will promote it. It is an awesome American Express rewards card. This is very unique. I am living in USA about 3 years. I don’t know why people are caring much for those rewards cards. These are not profitable at all if you dont spend much. It can even be totally lose for you. If APR is not lower than 20%. (Actually 15 percent) I had this card. It is shiny. However I had 22 APR with that. It means after a year later, I started to lose more than I won. When I purchased something, I had to pay 22 percent APR. It means it costed me 2.2 points. When I need cash advance, the rate of lose was even much higher. There are 11% guaranteed APR cards.Let’s say you will get this card with %20 APR. You will pay 11 dollars at every $100 worth purchases with other card but you will pay 20 with Propel American Express® Card. If you ever need cash advance, things will go worse. Let’s say I need $200 cash advance. 5% cash advance fee makes $10. (My current simple credit card is $6). That $4 difference makes 400 rewards points. Annual APR price is going to be $40. (My current simple credit card is $24). That 16$ difference makes 1600 rewards points. I believe you should find a rewards card with low APR. Now I use a simple credit card with 11.95 rate and I am happy. PS: I acknowledge that this is good card for those who have good credit history. But if your credit score is not excellent, you will need to look for alternative ones which offer reasonable APR for you. Actually with your calculation I am just paying 8% APR with this card. Your math is really poor. Still… I don’t like this card though. Limited categories in rewards points are annoying. Actually he is almost right about the calculation. Wells Fargo Propel is nothing after 12 months later. Better if you start to use Elan cards then. This card is very good. I am using this for a few months. It was very profitable for me. 12 months later, it is getting useless. I just keep paying for the card but still my balance is going worse. You go on to purchase from the card? I suggest you get your second card if you can and try pay your debts without purchasing with Propel. Your second card should be a low interest card though. My credit score is 640. Can I get another?